ELITE: Pitt B, et al. Randomised trial of losartan versus captopril in patients over 65 with heart failure (Evaluation of Losartan in the Elderly Study, ELITE). Lancet 1997;349:747-52. ELITE II: Pitt B, et al. Effect of losartan compared with captopril on mortality in patients with symptomatic heart failure: randomised trial-the Losartan Heart Failure Survival Study ELITE II. Lancet 2000;355:1582-7. CHARM-Alternative: Granger CB, et al. Effects of candesartan in patients with chronic heart failure and reduced left-ventricular systolic function intolerant to angiotensin-converting-enzyme inhibitors: the CHARM-Alternative trial. Lancet 2003;362:772-6. CHARM-Added: McMurray JJ, et al. Effects of candesartan in patients with chronic heart fialure and reduced left-ventricular systolic function taking angiotensin-converting-enzyme inhibitors: the CHARM-Added trial. Lancet 2003;362:767-71. Val-HeFT: Cohn JN, et al. A randomized trial of the angiotensin-receptor blocker valsartan in chronic heart failure. N Engl J Med 2001;345:1667-75. 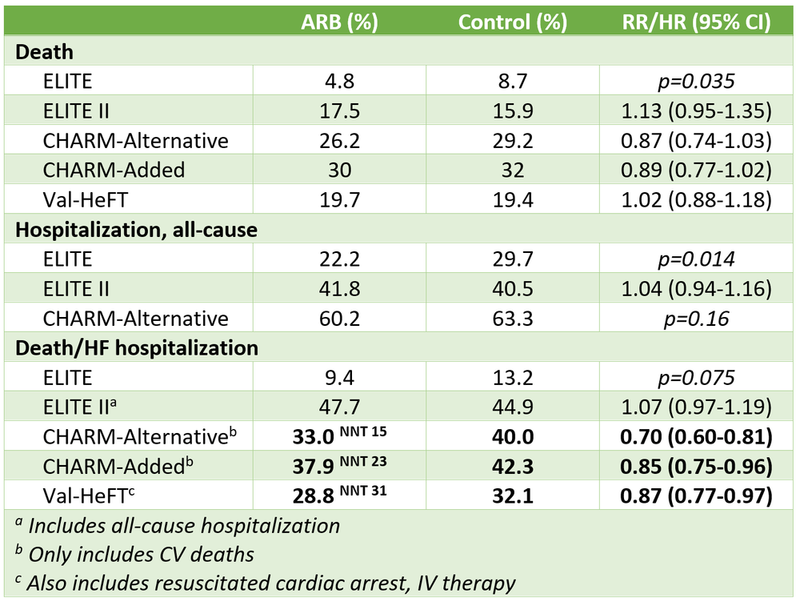 Bottom-line: In patients with HFrEF with suboptimal beta-blocker use, ARBs reduce the risk of death or HF hospitalization (NNT 40-80/year; mainly from reduced HF hospitalizations), whether added to ACEI or used instead in ACEI-intolerant individuals. ARBs increase the risk of discontinuation due to adverse events when added to ACEI (NNH ~20-40), primarily from hypotension, renal dysfunction & hyperkalemia. Patients in both trials had overall poor optimization of other HF meds (35-55% on beta-blockers, 5-25% on mineralocorticoid receptor antagonist) at baseline. Low risk of allocation, performance, detection and attrition bias, as all trials were randomized, allocation concealed, double-blind trials with blinded outcome adjudication, loss-to-follow-up <1% and intention-to-treat analysis.